The Fies Files: "Longing for the Tomorrow That Never Came." Neil deGrasse Tyson is an astrophysicist, author, director of the Hayden Planetarium, and the public face of contemporary astronomy. He's often called this generation's Carl Sagan, which I'm not sure is accurate or fair to either man, but it's close enough (in fact, Tyson is currently updating Sagan's classic television series "Cosmos"). 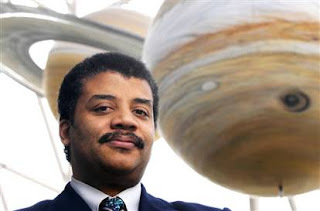 If you've seen a scientist talking about space anytime in the past five years--whether testifying before Congress or bantering on "The Daily Show"--chances are it was Tyson. The blue excerpt is going on the front cover and the full quote on the back. This sort of testimonial is a "blurb," generally solicited from the most impressive people you can convince to read your book, and Dr. Tyson was at the top of our dream list. He very graciously came through for us. I don't want to overstate the importance of one blurb--who really buys a book because someone they've heard of liked it?--but to the extent it might influence a reader to pick up WHTTWOT, we couldn't have hoped for better. Not convinced? Watch this video, which compiles a few of Dr. Tyson's public remarks, then try to argue he wasn't the perfect man for the job. Many thanks to him, and to Editor Charlie for making it happen. things is just gettin' better and better for ya'.